What are roman numerals chords and how and why are they used in piano chord progressions? Learn more about chords and how to understand these chord markings. The Roman numerals represent the steps of a music scale, either major or minor. From each step of the scale, a triad or a basic chord in root position can be built. These triads are also called "Diatonic" (through the key). The chord on the first step will then be called I, on the fourth IV, and the fifth V, and so on. The I, IV and V chords in any major or minor scale are the most important. They are the main chords of the scale. Why not use regular Arabic numbers? Since there are a lot of other numbers involved when playing chords, for example the "number label" for seventh chords (7); to avoid confusion, roman numerals are instead used to represent steps on the scale, as well as the chord built on that step. This also makes it easy to “translate” a piano chord progression to any scale you want. You just need to know the scale you want to use, and then find each chord from the steps in that particular scale. Well, those tell you to play in a specific tonality- while the roman numerals chords make it easy to play chords from any scale. Capital numbers: I II III IV V VI VII represent the chords in major. Small letter numbers: i ii iii iv v vi vii represent the chords in minor. Another number that might be added is V7, this means that the chord on the fifth step (V) of the scale is “colored” with a seventh. 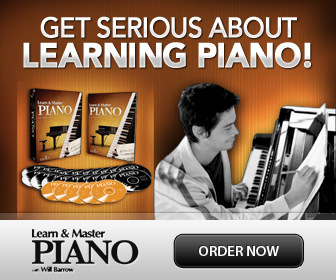 What are Piano Chord Progressions?